Solomon loved many foreign women. Besides the daughter of the king of Egypt he married Hittite women and women from Moab, Ammon, Edom, and Sidon. 2 He married them even though the Lord had commanded the Israelites not to intermarry with these people, because they would cause the Israelites to give their loyalty to other gods. 3 Solomon married seven hundred princesses and also had three hundred concubines. They made him turn away from God, 4 and by the time he was old they had led him into the worship of foreign gods. He was not faithful to the Lord his God, as his father David had been…9-10 Even though the Lord, the God of Israel, had appeared to Solomon twice and had commanded him not to worship foreign gods, Solomon did not obey the Lord but turned away from him. So the Lord was angry with Solomon 11 and said to him, “Because you have deliberately broken your covenant with me and disobeyed my commands, I promise that I will take the kingdom away from you and give it to one of your officials. The wisest man on earth died as an apostate and disgraced his Godly heritage in pursuit of loving his women and appeasing their gods. Both Samson and Solomon lost their way because they opted to ignore the advice of Proverbs 6:20-23. By refusing to adhere to the advice of their parents to stay away from certain women, one lost his strength and the other left God. 2. The prostitute or the promiscuous woman will provide you pleasure, but she will destroy your pockets (Proverbs 6:26). She will ensure you have a good time, and make you pay more than what you bargained for. The story of Tamar and Judah is a prime example of how a “prostitute” can take all you have and bring you to shame (Genesis 38). Here Tamar disguised herself as a shrine prostitute in order to have a son and ensure she obtained the inheritance that was hers by marrying Judah’s eldest son. Judah slept with her assuming a goat will be all that was required, and by the end of the story his reputation was the real wage he paid. Loving prostitutes will leave you destitute. 3. 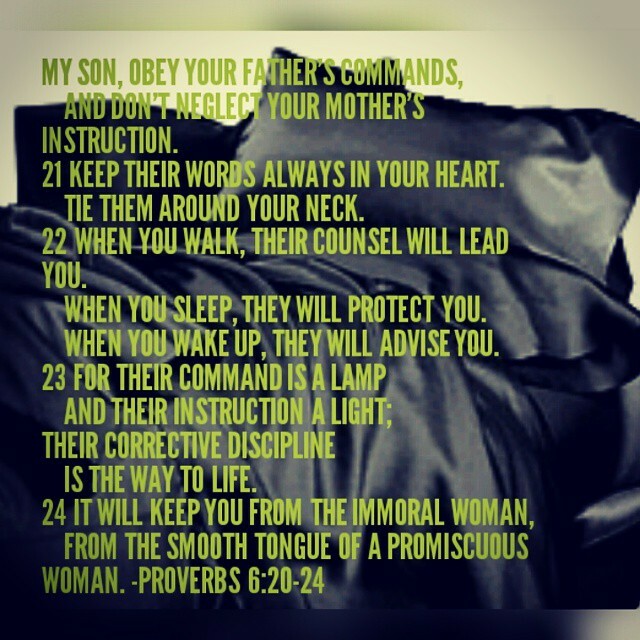 Sleeping with another man’s wife will cost you your life,” is the warning the writer gives his son in Proverbs 6:26. This death can be in many areas of a man’s life, just ask David (2 Samuel 11). I do not desire to call Bathsheba an adulterer in the traditional sense of willingly seducing a man, but the fact is she was married when David slept with her. As a result of attempting to cover up his sin, David orders Bathsheba’s husband to be killed in battle. He is confronted by the prophet, and God pronounces judgment concerning the matter in 2 Samuel 12:11-13, “This is what the Lord says: Because of what you have done, I will cause your own household to rebel against you. I will give your wives to another man before your very eyes, and he will go to bed with them in public view. 12 You did it secretly, but I will make this happen to you openly in the sight of all Israel.” David’s decision to sleep with another man’s wife cost him his newborn son and brought a curse of discord between him and his other children (Read 2 Samuel). David did not die physically, but he was spiritually bankrupt (Psalms 51) and he loss his family life. The same will occur to anyone who lays his head in the bed of a married woman. now this is what GOD ordered for men. First hand I understand the dangers of loving any women in those categories and I thank you Charity fro sharing such a message.